When testing for free chlorine most test methods use DPD-1 as the test reagent, though in the United States the USEPA has approved an alternate method (SenSafe Free Chlorine Water Check) for testing free chlorine levels in drinking water. We have found that online pool stores such as serve as very convenient place to purchase DPD-1 test reagents. As of right now, In the Swim has 1,000 DPD-1 tablets (for use in 10mL samples) available for less than 5 cents per test! Easier to Use Form of DPD-1 Chlorine Test Reagent? Looking for an equivalent but easier way to test free chlorine using your existing meter or test system that uses a 10mL sample size? If so, DPD-1 ReagentStrips function the same as or better than traditional DPD-1 test tablets, powders and liquids. 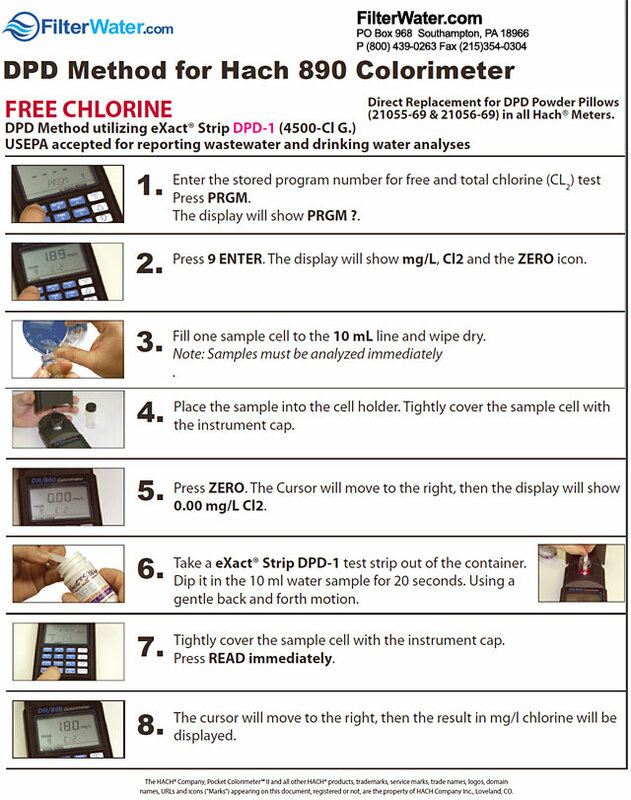 For a simple demonstration of how the DPD-1 ReagentStrips for free chlorine testing work in a Hach water quality testing meter, take a look at this free chlorine testing flowchart that illustrates how much easier DPD-1 ReagenetStrips make free chlorine testing.